Few political developments in Latin America’s democratic life have been as unexpected and controversial as Peru’s former president, Alberto Fujimori, receiving a presidential pardon. Having served less than half his sentence – 25 years for serious human rights violations that include killings, kidnapping, and torture, in addition to corruption and bribery – Fujimori’s infamous Christmas pardon has placed Peru’s rule of law and presidential legitimacy under intense scrutiny. In a region where corruption is rampant and impunity the rule, Fujimori’s imprisonment was viewed as a milestone, an example of justice for the people. As a result of the rising political stability and consistent investment growth, Peru continues to enjoy prosperity and endure difficult times in the region. To understand the consequences of Fujimori’s pardon, it is crucial to reflect on how the pardon came to pass. Pedro Pablo Kuczynski (PPK)’s ascent to power was a by-product of Peruvians’ deep anti-Fujimorista sentiment: the rejection of the dictatorial leadership and corruption during the 90s. It was not the recognition of PPK as fitting for the presidency, but rather the will to keep anyone with the Fujimori surname out of government at all costs. 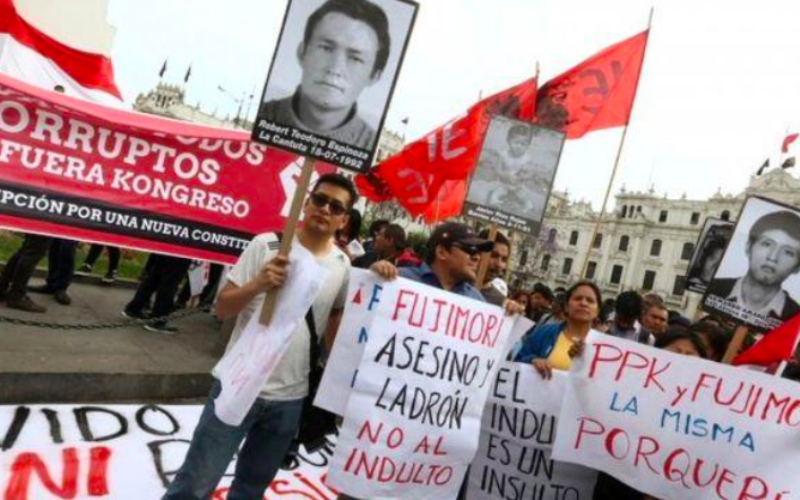 Fuerza Popular (FP), Keiko Fujimori’s party, amassed significant popular support by the time of the 2016 elections from people who revered her father Alberto for his victory over the radical left Maoist Shining Path movement. Hence, this polarization lays the framework for PPK’s presidential developments since the 2016 election. The antagonising endeavours from then-majority congress party FP – such as censoring ministers, blocking reforms, and attempts to vacate him – made many experts regard PPK more as an elected hostage than an executive leader. In parallel, the bullying attitudes from FP created a feeling of sympathy among non-Fujimorista societal sectors who believed that in defending the president, they were defending the essence of democracy vis-à-vis an obstructionist opposition who wanted to forcefully seize power. For example, the private sector sympathised with the president’s finance background and the press was in large part repressed during Fujimori’s time. PPK managed to avoid impeachment, from charges for alleged ties with Odebrecht, by a mere ten votes from Fujimorista legislators who abstained, led by Alberto Fujimori’s youngest son Kenji. Three days later, Alberto Fujimori was issued a pardon despite many assurances from the administration that pardons were not negotiated. The was no definite proof of imminent death and it was an evidently rushed procedure. This is not to say that a humanitarian pardon was not feasible, but rather the medical evidence was at best dubious making it invalid. The pardon could have been part of a bigger, appropriately executed reconciliation strategy. Nevertheless, the executive’s decision to effectively trade PPK’s position in power for Fujimori’s pardon was far from the right one. 80% of Peruvians believe the pardon was negotiated, further exacerbated by revelations on just how far back these agreements went. Unlike the pardon, the results have been predictable: social turmoil, massdemonstrations across the country, and political instability. In other words, a polarised country where one half celebrates the vindication of the leader that gave them peace sans terror, whilst the other half vehemently rejects the president who deceived them and pardoned a dictator. To make matters worse, the Inter-American Court of Human Rights is a few weeks away from giving its verdict (after several human rights pressure-groups raised their voice,) andpredictions are grim. How does the government recover from such a detrimental loss of legitimacy? The president would have been better off being impeached, going out of office with the aura of a martyr, or a victim of Keiko Fujimori’s dictatorial thirst for power than the puppet-esque figure he is viewed as today. With PPK’s recent struggle to form a new cabinet, amidst all the post-pardon resignations, new impeachment requests, and his failure to appease the public, he’s likely counting down his days in power.